I’ve just finished killing our dinner. 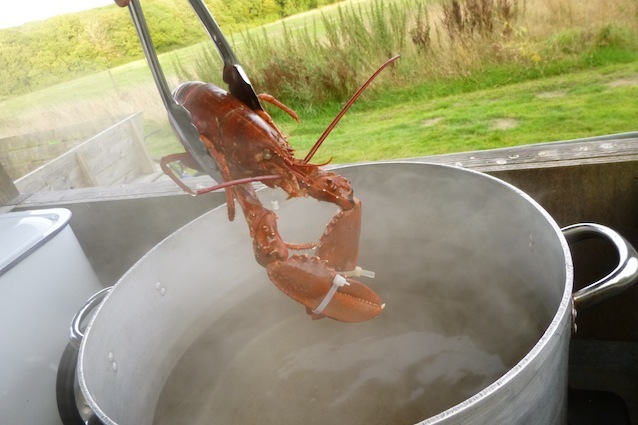 The faint knocking noises emanating from the pot of boiling water on our camping stove have thankfully stopped, so the lobsters are hopefully good and dead, but my heart was pounding and the first minute after I’d dropped them in didn’t feel great. Less good for them, clearly. However, they’ll be very much appreciated in 20 minutes or so: we’re glamping – there is no other word for staying in a geodesic dome with a double bed, Welsh woollen blankets and a log burning stove – at the fabulous Fforest , an experience to overcome the reluctance of the grumpiest camping refusnik, near Cardigan in west Wales… and we’ve run out of food for tea. The lobsters were a gift, and one we were very thankful for when we realised, at teatime, that we’d got the date wrong for the campsite’s weekly Pizza Night. The single tin of baked beans and one stale-ish roll we had left were wolfed down by the kids. 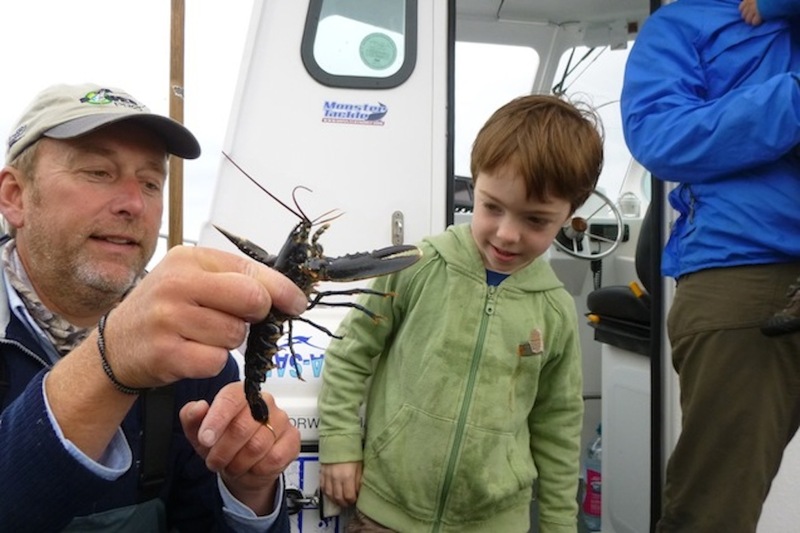 Which meant our only option – yeah, all right – was the two shiny blue-black lobsters we were given this morning by Tim Harrison of Sea Bass Safaris, at the end of our family crabbing trip out into New Quay bay. You don’t find any fishy creatures in The Gruffalo or The Gruffalo’s Child – forests aren’t great habitat for them, to be fair – but we’re on holiday in Ceredigion, and so it would seem ungrateful to ignore the plethora of underwater wildlife that lies just off this stunningly beautiful coast. 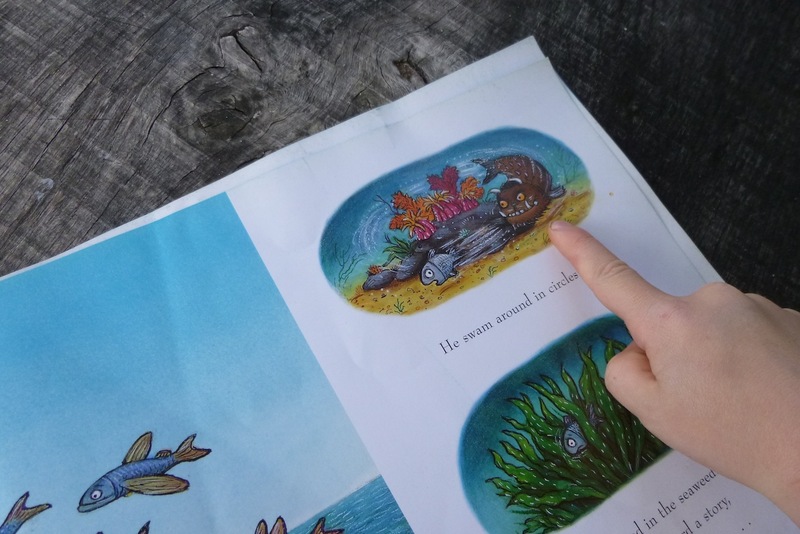 And besides, Julia Donaldson and Axel Scheffler’s “Tiddler” storybook is stuffed to the gunnels with exciting sea creatures, not to mention mythical ones, including a mermaid who rescues Tiddler, an adventurous young fish, from a treasure chest his explorations have unfortunately got him trapped inside. Thinking about it, I rather suspect Sam has no idea that mermaids are not a bona fide species, and I don’t intend to disillusion him any time soon. 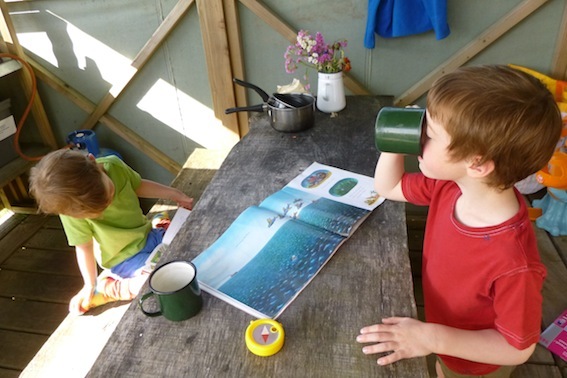 His knowledge of sea-life is pretty good, mind – a combination of having Tiddler read to him a lot (it’s definitely one of our favourites) and a growing obsession with the children’s tv programme The Octonauts. So when Tim, a professional fishing guide who taught me how to cast for sea bass in another, child-free life, emailed to say he’d recently begun running hour-long crabbing trips for families, we leapt at the chance to show the kids some monsters of the deep. But before we met Tim and his wife, Corrine, at the end of New Quay’s old stone sea wall, Sam was in for a treat. While I was parking up with Mungo, he and Jim were gazing agog at a dolphin playing just at the edge of the harbour. By the time I arrived clutching both Mungo and sufficient provisions to sustain our maritime adventurers for a taxing morning out on the ocean wave, Sam was grinning like a loon, in that intense, delighted way that only happens when you’ve had a proper, thrilling, wildlife sighting. 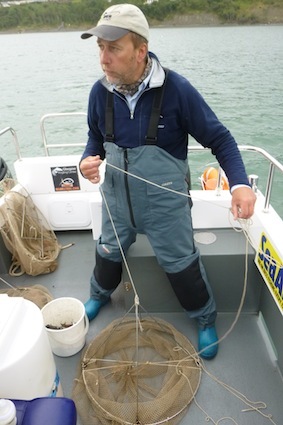 Once we’d got the boys on board and chugged gently to just beyond New Quay’s little harbour, Tim showed them how to lower his specially designed shellfish nets. With the bait positioned carefully at the top of the nets – Sam rather intrigued by the grisly business of turning mackerel into tasty bite-sized crab treats: “is that fish blood, Mummy?” – we sunk 15 or so nets to the bottom, and waited. It didn’t take long – luckily, as the kids had already eaten their way through their packets of Quavers – till we got our first creature that was a perfect fit for one of the illustrations in Tiddler. A velvet swimming crab, still hanging onto its fishy bait, waved its pincers and was peered at somewhat doubtfully by both boys before being dropped into a clear plastic bucket full of seawater. It skittered about before it settled and Mungo, curious, kept trying to dabble his fingers in the water – a less than good idea given that Tim told us even a small crab can give you painful nip. That first velvet crab – so named for the soft, slightly furred top to its shell – was followed by many more, plus a lobster caught by Sam to great cheering from the rest of the crew, several translucent prawns, a baby pouting (which we felt we had to name Tiddler in honour of the occasion) and some pieces of what looked like seaweed, but were in fact a tiny, slender species of spider crab that somehow persuades seaweed to colonise their bodies as protective camouflage. By the end of the trip Sam had graduated from being unsure about being on a boat at all, to energetically hauling up net after net after net in his eagerness to find out what we’d caught. Mungo was simply knackered: probably a bit overwhelmed by the strange new environment. Success rating: 9/10 – would have been 10/10 if Mungo had been perhaps a year older and slightly less discombobulated by being on a boat. 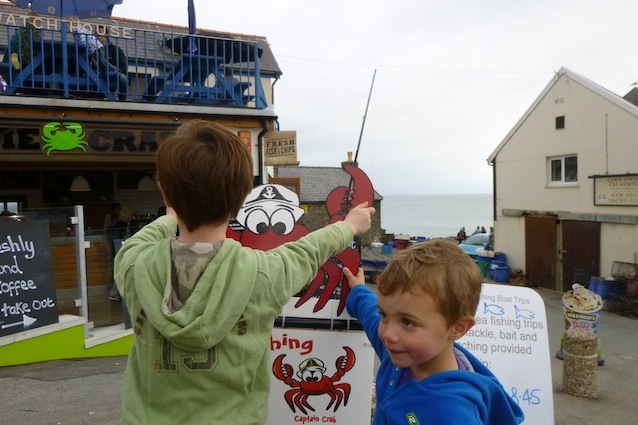 Do it yourself: Book a crabbing trip with Tim Harrison in New Quay, Ceredigion, west Wales. £10 adults, £5 children. We got it for free because we know Tim and Corinne from when I wrote up their sea bass fishing trips for Coast magazine a few years ago. 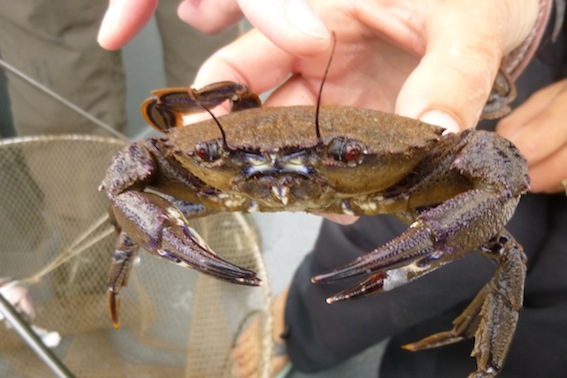 Good at any time of year, as long as it’s dry and you wrap up warm: the crabs and lobsters aren’t going anywhere. Look out for dolphins and porpoise, which you stand a chance of glimpsing from the boat, though it’s more likely on a longer, two or four hour trip out into Cardigan Bay, run by various operators out of New Quay.